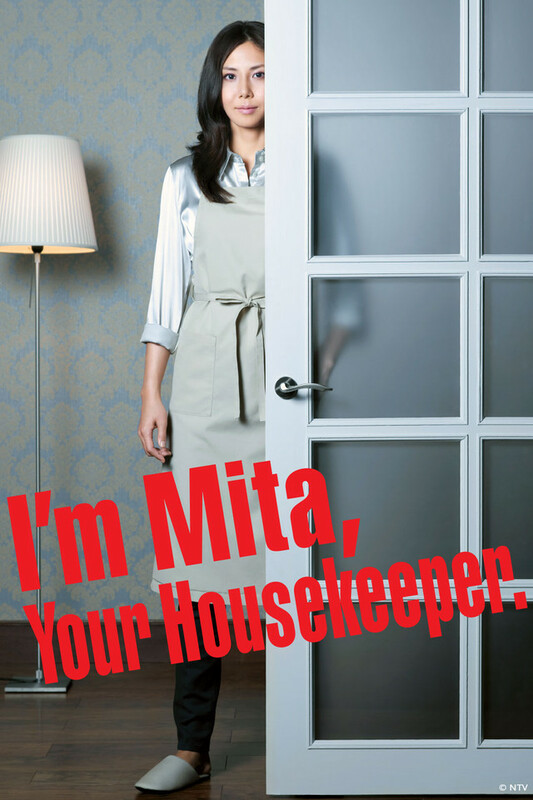 I'm Mita, Your Housewife is the first J-drama I watched from beginning to the end. I went a slight non stop marathon of watching it. I must say I enjoyed almost every minute of it. The story is basically a family of five had just lost their mother/wife in a horrible accident. To cope with the fact that no mother is around to help with food and the house the father orders to have a Housekeeper. That is where the main story begins, Ms Mita arrives and the family's life will never be the same after that fateful day. This is one of the first J-dramas I have finished, and I love it. I know how Ai Wagatsuma feels when she watches dramas but I digress. This is my first review I hope you liked it. Just as the last reviewer, this is the first J-Drama I've watched beginning to end, but it was amazing. I'm not going to retell the plot for you. Look it up on Wikipedia. I just wanted to say that among all television shows and movies I've watched (including all of the hundreds of anime series I've watched), this is one of the best stories I've ever seen. Good job. This was the best drama iv'e seen. Watching half through the first episode I thought it was going to be a creepy comedy type kinda thing but it was way more then that. I cried and laughed in every episode and it was simply glorious. Best drama iv'e ever seen. I definitely recommend watching it. First: Every couple of episodes there is a dramatic cliffhanger. As soon as you finish one of those cliffhanger episodes, stop watching!!! . Seriously. Give yourself a minimum of 24 hours (preferably 48) to digest what has happened. You will appreciate it that much more. Second: Do not watch the final, special episode. The last normal episode of the series does a fantastic job wrapping up the show and watching the "Special Digital Edition" episode will just distract you from the true beauty of the ending. This is an excellent show! Like several people have posted, this is the first J-drama I have watched although I've watched over 200 anime shows on Crunchyroll. This show really surprised me. Fantastic story and very well done. The acting (especially the main character) was also excellent. WOW! Just WOW! That fast paced plot winding down during the end and the reveal of everything is amazing. I couldn't tell what would happen next with Mita being so unpredictable. I loved every bit of it. I heard the Korean version is 'better' so I'll defiantly look in to that. Highly recommended!! The best intense drama ever!!!! This show is AWESOME! I'm in love with Mita. The story line is exceptional. I recommend this show to any one who wants to escape reality and get caught up in a whirlwind of emotions. It's all about the, "Drama, Drama, Drama!" I can't say it enough. Any more info would just spoil the experience. Watch this Show NOW! This was such an amazing drama. That kind of went against the usual tropes you see in tv shows of the normal. Mita was an amazing character, despite having no real emotion. To be honest, you kind of don't want her to develop any emotions. You love seeing that after what most shows would consider a touching moment, Mita would just (semi-SPOILER ALERT) hand them the invoice for overtime she had to put it. Watch this show and give it a chance. Firstly, a trigger warning for suicide - the family this show is based around has a lot of issues. It's not often very in-your-face, but it's there. Secondly, you might be horrified/crying one minute, then laughing uncontrollably the next. The show as a lot of moments that kind of shake you out of whatever they just threw at you that'll throw you for a loop. It's a crazy ride! Thirdly, the family will drive you crazy each episode. They're highly imperfect and impulsive, but they're still pretty nice in the end. Fourthly, Mita Akari is an amazing character portrayed fantastically by the actress. I highly recommend you watch a few episodes before you decide whether you want to keep watching. At first I thought it was going to be a sort of comedy-drama but it was much more. In summary it's about a family that is hurting, badly, as it takes place shortly after the mother dies. The first few episodes jumps right into it and sets the tone. Some of the episodes are really dark, heavy, and serious, but there are also a good balance of lightness and laughter. All I can say is to be prepared for an emotional rollercoaster - stick it out and you won't regret it!